Super competent for any task except off road, the sleek new BMW M6 Gran Coupe is all about speed. Offering supercar performance and road-holding, the BMW M6 Gran Coupe then bucks the muscle car trend and provides superb comfort for four large adults on any long journey. There is space for three across the back seat, however the central position is not as comfortable as the window seats. Just imagine cruising the tarmac around Australia in a machine that’s so finally engineered as this car. Just as well the BMW M6 Gran Coupe comes with cruise control, as you could probably set some new land speed records in this one! Muscle car styling flows through the BMW M6 Gran Coupe’s exterior bodywork. Side skirts, a prominent bulge in the bonnet, large air intakes that capture the air to firstly hold the car to the road and then to push air into the engine for enhanced performance, an elegant four-door coupe roofline, massive exhausts, huge rubber and stunning alloys set the new M6 right apart. Through the spoked alloy wheels you can see massive carbon ceramic disc brakes – and this is not just for show. They do such a magnificent job of controlling the cars high speed potential. A fraction over four seconds is all it takes to reach 100 km/h from a standstill, and the limiter restricts the BMW M6 Gran Coupe from going way beyond 250 km/h – even though it could! With 680 Nm available from as low as 1500 rpm, this 412 kW, V8 mile muncher will blow most cars away at any speed and, with the poise and agility to match, the BMW M6 Gran Coupe is a wonderful car to drive fast on any twisty back road. For those who are satisfied with just the knowledge of what lies under the bonnet but in reality will only use the raw power on rare occasions, the ability of the BMW M6 Gran Coupe to travel with flawless docility in everyday traffic will make this a car that’s very easy to live with. Having had extensive tuning on the Nordschleife of the Nürburgring, a range of innovative technologies optimise the driving characteristics. Standard on the BMW M6 Gran Coupe are things like Dynamic Damping Control which adapts the suspension individually. The driver can set the car in Comfort, Sport and Sport Plus modes, depending on how extreme the drive will be. M Dynamic Mode is at the ready to offer the assistance of Dynamic Stability Control which will act to correct and stabilise the car when the limit has been exceeded. 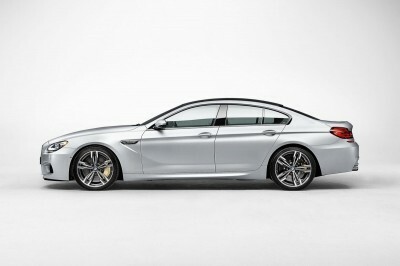 The new M6 comes with a carbon roof which lowers the centre of gravity, all the more. Head around to the rear of the vehicle and you find some gorgeous chrome exhaust tips that are surrounded by a carbon diffusor which provides greater down force at higher speeds. It looks really cool and has a very important purpose to aid the balance of the car at extreme speeds. An M Differential works to spread the traction evenly between the massive 20-inch rear tyre set for optimum grip. The interior of the BMW M6 Gran Coupe is magnificent, and despite the track performance the car is gifted with, the driving experience is superbly luxurious. BMW kits out the M6 Gran Coupe with all the latest technology: Heads Up Display, three point seat belts in all positions, Park Distance Control, Lane change and Lane Departure warning signals, Automatic air conditioning with 4-zone control, a front windscreen with an infrared reflective surface, full leather merino upholstery (stunning), electronic front seats with their own ventilation system, a six disc DVD changer, Bluetooth, a twelve-speaker HiFi sound system, internet connection, satellite navigation, a high definition central dash display screen and even a TV receptor. One of the design statements of the M6 interior is the stylish central dash that has an arm that sweeps off to meet with the dash on the front passenger side. Everything about the new M6 Gran Coupe interior is classy, modern and sophisticated. This is a superlative machine that is certainly going to be a benchmark model for years to come. Some of you may remember the M6 of old which still draws attention with its shark-like looks and great performance, so it’s great to see the new BMW M6 Gran Coupe is a very worthy successor. For any more information on the new BMW M6 Gran Coupe or, for that matter, any other new car, contact one of our friendly consultants on 1300 303 181. If you’d like some fleet discount pricing (yes even for private buyers! ), we can submit vehicle quote requests out to our national network of BMW dealers and come back with pricing within 24 hours. Private Fleet – car buying made easy!